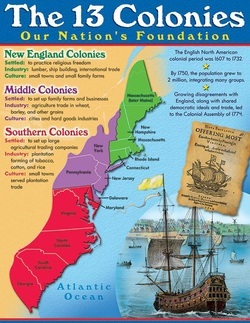 Learn more about the colonies!! In the 1600 and 1700's thousand of settlers form England came to North America. 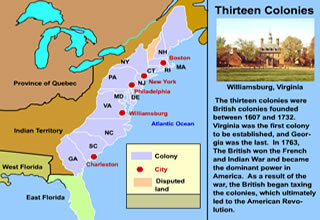 Over time they founded the 13 colonies along the Atlantic Ocean. 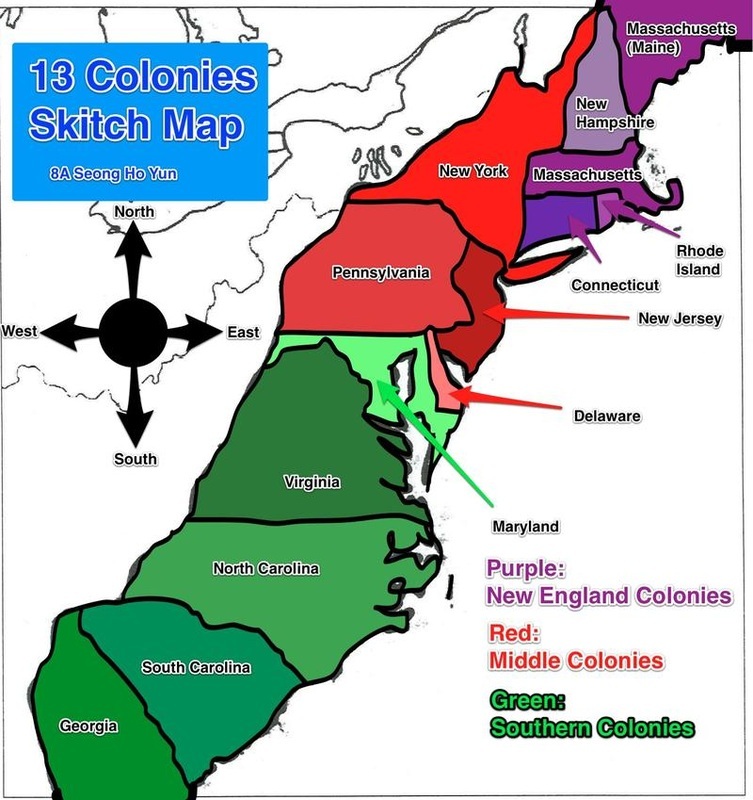 The colonies were broken up into 3 regions: New England, Middle, and Southern. Each colony had different geography that influenced where people settled. The New England Colonies had soil that was too rocky or sandy to farm. Their where many natural resources; forests (wood to build houses and ships) and they used the ocean for fishing. The middle colonies had rich soil for farming. There were deep wide rivers (Hudson) that ships could travel inland. There were many hills and valley. Southern colonies had many rivers, bays and wetlands which provided rich farmland. Colonist found valuable natural resources in North America. They shipped wood, fish, and crops to England. England needed these raw materials. Then England shipped finished products such as: furniture and tools to the colonies. A trade network developed among England, Africa, and the colonies. This shipping route formed an imaginary triangle across the Atlantic Ocean. 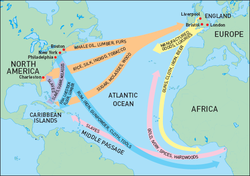 This became known as triangular trade. The English government wanted to gain more from trade with the 13 colonies. They made new laws called the Navigation Acts. These laws controlled how the colonies could ship goods and who the colonies could trade with and what products they could trade. In 1664, England and the Netherlands were both trying to control North America. Peter Stuyvesant saw English warships in NY Harbor and knew that England was ready to go to war. Many Dutch colonists did not want to fight because they knew they were outnumbered. Also, they thought that Peter Stuyvesant was unfair and they convinced him to give up. England now has control of New Amsterdam. Richard Nicolls, and English Colonel, renamed the colony New York and James, Duke of York (he owned the land). 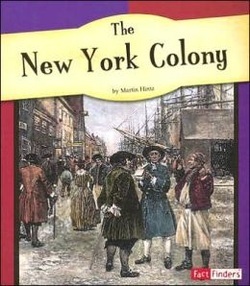 As a result, New Netherland now became New York and New Amsterdam became New York City. England gave the colonists rights such as, trial by jury and continued to allow women and free Africans to own land just as the Dutch did. The colonists wanted more rights such as an assembly. James, Duke of York denied their request and then the people decided to stop paying taxes. James did not like this and agreed to an assembly (a group of elected by the people to make laws). Memembers were elected in 1683 and wrote the "Charter of Liberties". It described how the government would work. The Charter of Liberties became law in 1691. It protected freedom of religion, it also stated that the governor did not control the assemble. THE CHARTER OF LIBERTIES WAS NEW YORK'S FIRST PLAN OF GOVERNMENT. 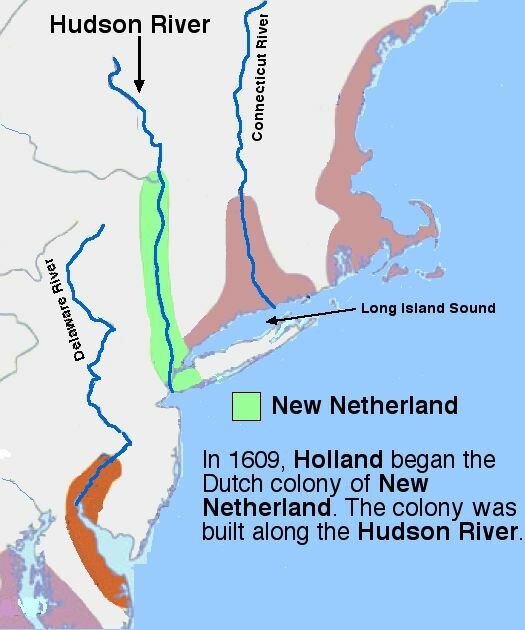 In 1624,the Dutch started a colony and named it New Netherland. Cornelius May, the governor, traded furs peacefully with the Algonquians. As the colony grew, farmers wanted more land. The Algonquians did not like this. In 1643, Willem Kieft became governor and asked the Algonquians to give them food and furs. Kieft attacked those who refused. Native Americans joined together to fight the Dutch. Eventually, Native Americans began moving away because of wars with settlers, or were forced to move because colonists took land, and many Native Americans died because of diseases that they caught from the Europeans. 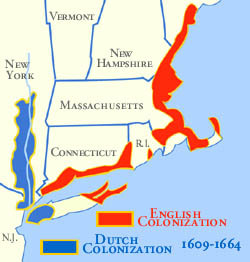 The Dutch bought Manhattan Island and a settlement grew. New Amsterdam was located on the south end of Manhattan Island. The island had rich natural resources such as: rich soil (good for farming), forests were filled with trees ( hunting and fur trade), good harbor ( ships could easily get into and out of and travel on the Hudson River). As a result, the settlement grew because of these great natural resources.